10 Worst Toys for Children in 2018 by W.A.T.C.H. For the past 40 years, World Against Toys Causing Harm, Inc. (W.A.T.C.H.) has researched and compiled a list that included the cute ones, the cuddly ones, and the ones with obvious deadly traps. With the holiday buying season in full swing, please avoid these toys and watch for others with the same hazards. Most of the dangerous toys have inaccurate warnings and labels indicating the appropriate age for children to play with them. And sometimes items that made the list in years past continue to be manufactured by the toy industry, often in newly designed packaging. Despite hazards and recalls, some of these toys still find their way to online sales, used toy stores or, even worse, are dumped on foreign markets. We have long been advocates for safer products for children. Bottom line for gift givers is to not expect that a toy has sufficient checks and balances to prevent the dangerous ones from reaching store shelves or e-commerce sites. Even toys that pass existing safety standards can be dangerous. 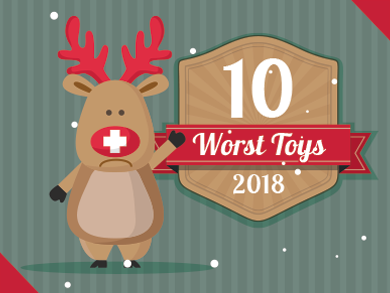 Here’s the list for 2018 “Worst Toys.” For a full description, go the W.A.T.C.H. website. This entry was posted in Unsafe Products. Bookmark the permalink.